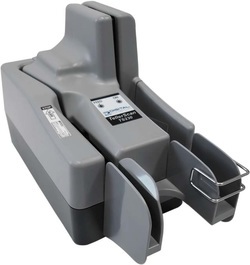 Compact and cost effective, the LS40 check scanner is specifically designed for remote deposit capture applications. Ideal for small spaces, this single pass scanner features dual cameras and intuitive vertical document insertion - to process a check in less than one second. 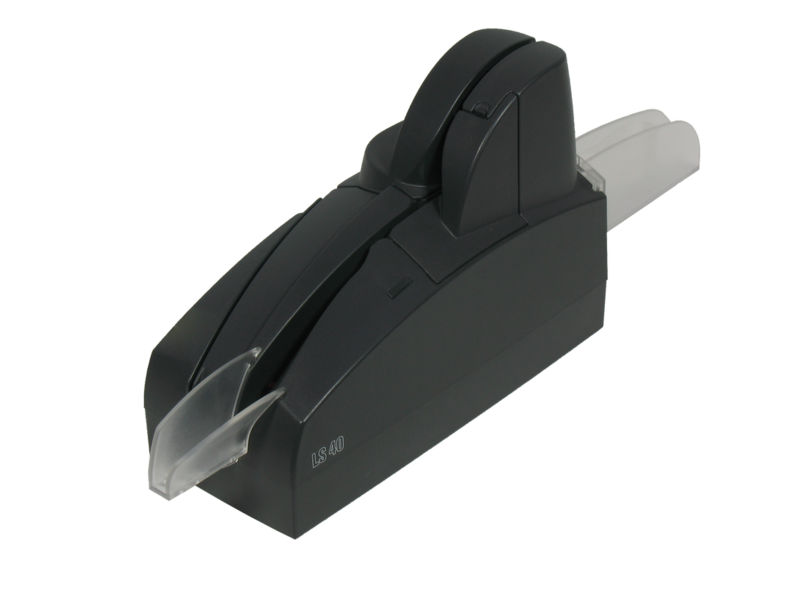 The LS40 is small in size but big on functionality - a check scanner designed specifically for the needs of merchant payment processing, with quiet operations, robustness, durable styling and optional card reader. The LS100's compact design makes it ideal for efficient teller and remote deposit capture - fitting any space from a small desk or bank teller station to a small business or merchant environment. The LS100 features fast front and rear check imaging in one pass, a vertical single feed and an output pocket for up to 20 items. The LS150's fast and quiet performance, coupled with its sleek design, make it the superior choice for teller, branch and high volume remote deposit capture applications. The LS150 has a single handed item insertion to ensure maintenance of eye contact with the customer. Magnetic flip open doors make for easy cleaning and maintenance. 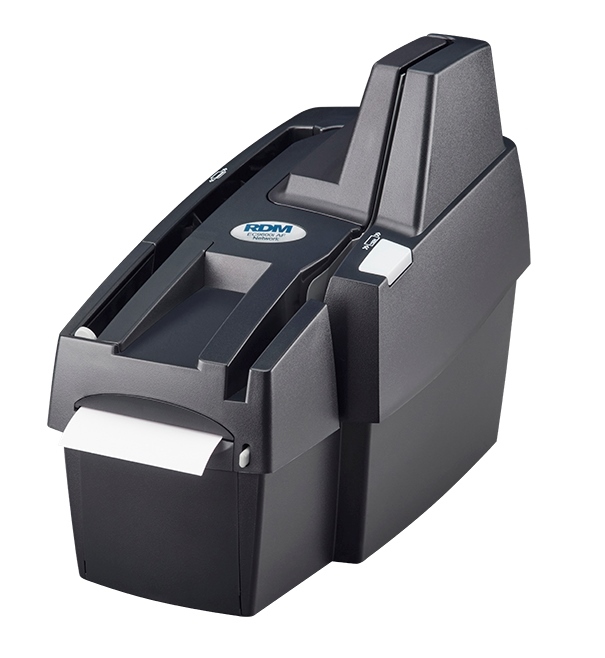 The heavy-duty, feature-rich ARCA LS515-SE scanner for bulk check and document processing is a workhorse for high volume branches, regional processing centers and remittance/lockbox applications. Proven reliability, intelligent sorting and a high throughput with real life documents makes the LS515-SE the right choice for your mission-critical operations. 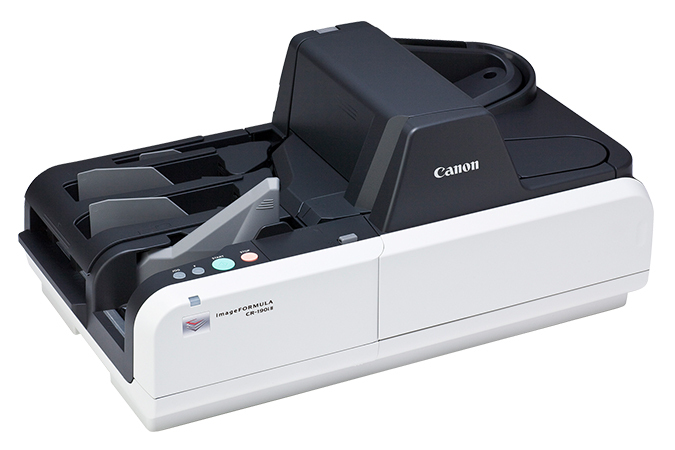 The Canon CR-L1 was designed with Remote Deposit Capture (RDC) users in mind. This check scanner is an easy-to-use solution for high volume batch RDC and remote lockbox check processing. 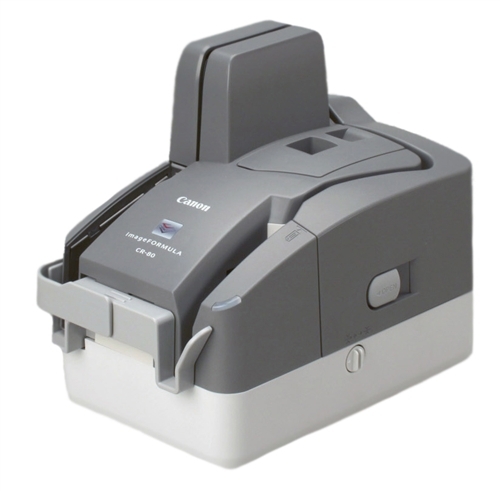 The Canon CR-L1 can scan up to 45 checks per minute and has a 50 item Auto Feeder and Eject pocket. This check scanner also includes: high-quality image scanning, precise MICR reading and reliable item handling. The Canon imageFORMULA CR-50 Compact Check Transport is an easy-to-use solution to decentralize and advance traditional check processing. It offers high-quality image scanning, precise MICR accuracy, reliable item handling and other useful features to help facilitate efficiencies and successful electronic transactions. 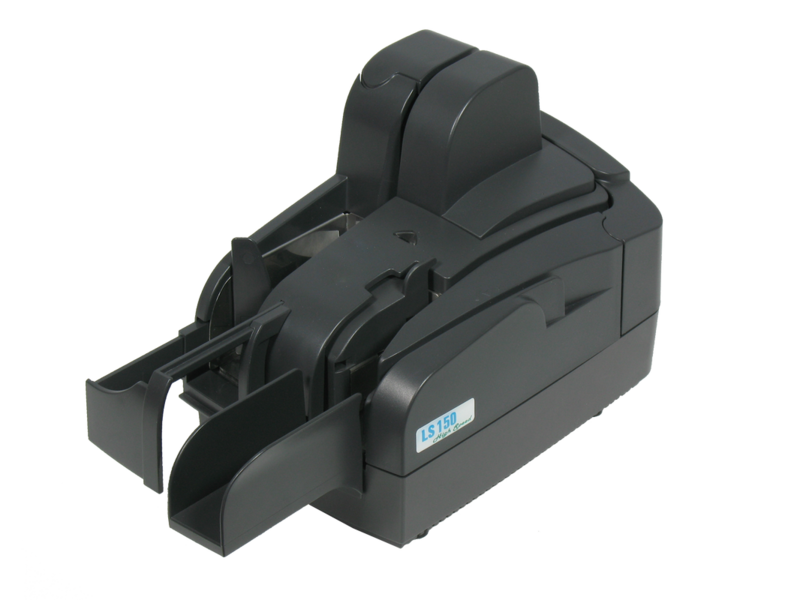 The CR-50 check scanner is ideal for moving paper checks and related small documents in front-counter teller settings, for merchant/remote deposit capture (RDC) applications and for low-volume remittance processing. The Canon imageFORMULA CR-80 Compact Check Transport's small footprint makes it ideal for teller counters, merchant desks and other space-constrained areas. 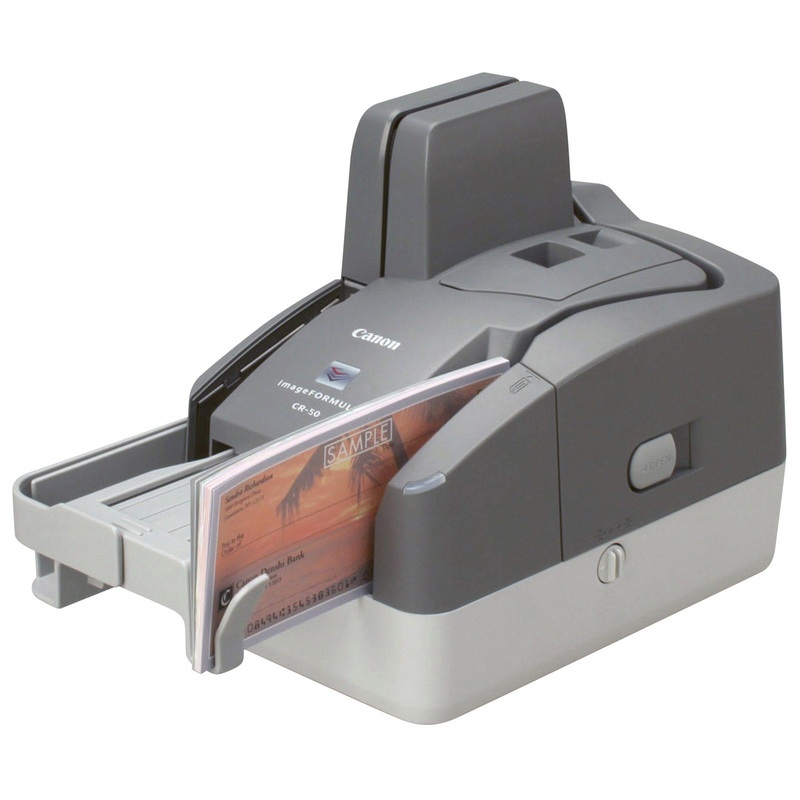 The CR-80 check scanner has sophisticated features for efficient check processing. The built-in imprinter prints endorsement information on checks before scanning, and four-line virtual endorsements can be added to the scanned image. To help maximize performance, an Ink Level Alarm alerts users when imprinter ink is low, and a logging tool can track the number of scans, jams, double-feeds, imprints and LED hours of use. 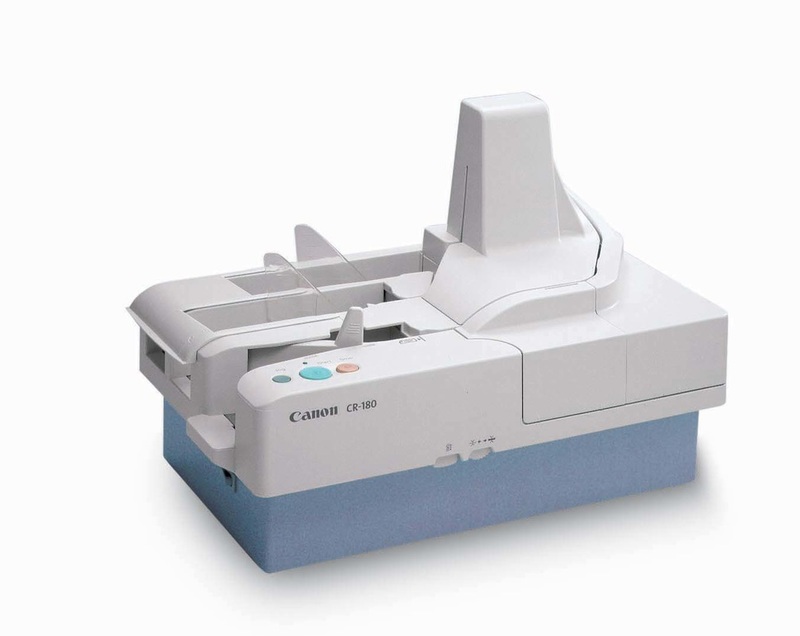 The Canon CR-120 is designed for easy use and has multifunction compatibility, combining the functions of the peripherals found at the teller station into one single device, thereby reducing counter space requirements and helping to improve efficiency. Scanning up to 120 items per minute with a 150-item Automatic Document Feeder, the CR-120 check transport can perform high-speed scanning for a wide range of document types, such as business and personal checks. 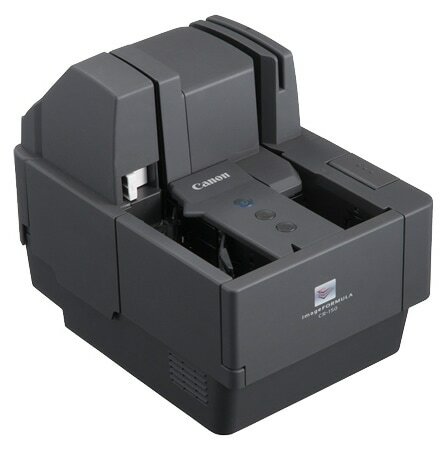 The Canon CR-150 can scan up to 150 items per minute and includes two additional UDB ports in the hub to connect to additional USB peripheral equipment such as PIN pad, receipt printer, fingerprint authentication device and more. 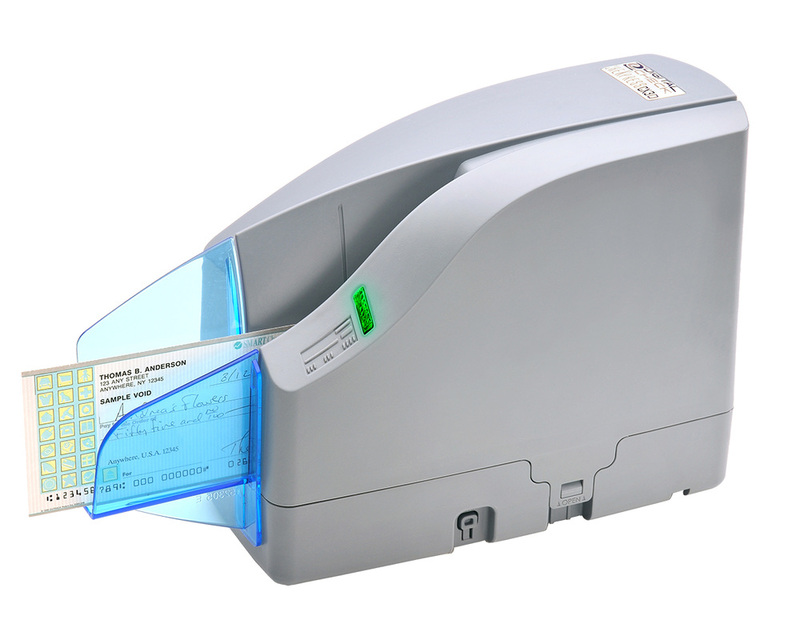 The CR-150 is also equipped with a built-in, five-line imprinter that prints and captures endorsement information on checks. *Note: This product can be serviced on a limited basis depending on parts available at the time. 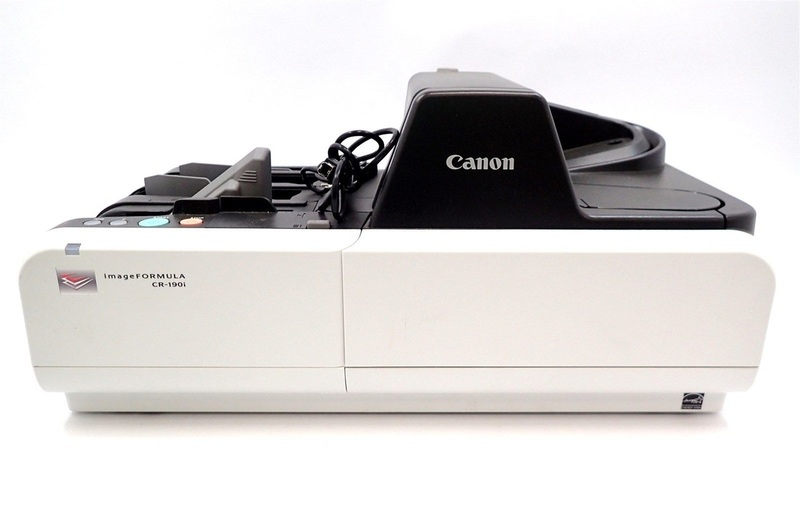 The Canon imageFORMULA CR-190i High-Volume Teller Check Transport is the cornerstone for production check processing, delivering high performance, reliability and image quality. With an efficient countertop design, the CR-190i is capable of meeting even the toughest challenges. The CR-190i can help financial institutions that handle large volumes of checks improve the efficiency of payment processes and treasury management. This results in faster access to funds, reduced costs and increased ROI. The CR-190i II check transport can assist in handling large volumes of checks to improve the efficiency of payment processes and treasury management in areas such as financial institutions, utilities, and other organizations. Many features of the CR-190i II check transport are ideal for high-volume remittance processing, lockbox and back-office/branch capture. Bundled with the Silver Bullet Ranger API, this check transport can help ensure compatibility with virtually any check processing software application. The TellerScan TS500 teller capture scanner represents a breakthrough in document capture at the branch. As fast as the production scanner/sorters at the back counter, smaller than many teller window check scanners, and ready for the connected branch of the future, it is poised to be the check scanner of choice for bank branches around the world. 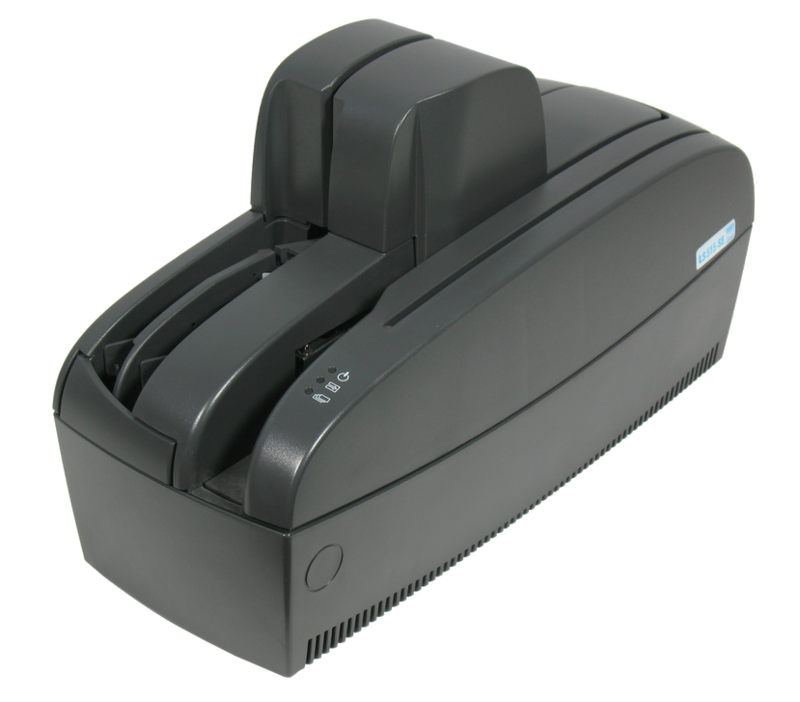 *Note: This model is a companion scanner to the Digital Check TS500 TTP - Teller Transaction Printer. View Printers to learn more. 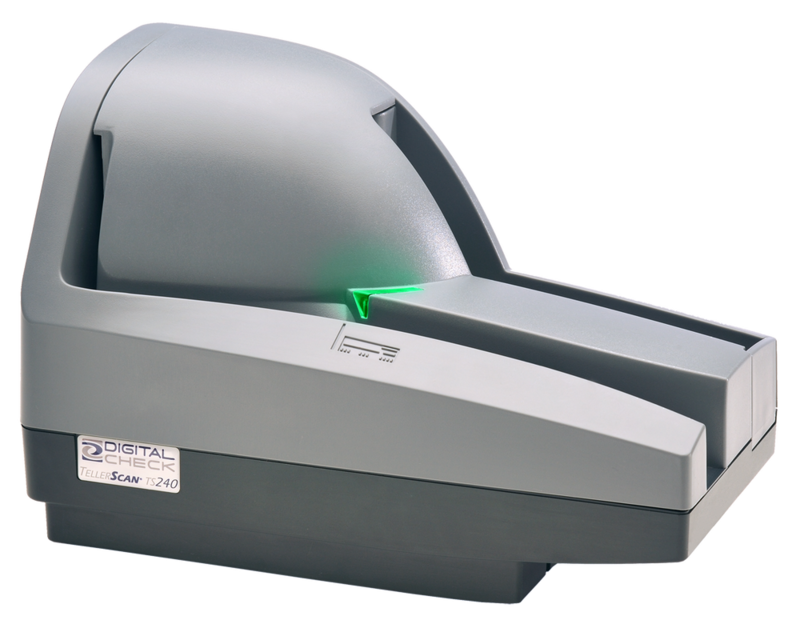 The TellerScan TS240 teller capture scanner is Digital Check’s workhorse check scanner for the teller window or high-volume remote deposit capture environments. Powerful enough to handle large stacks of documents and affordable enough for small businesses, the TS240 remains the most popular and versatile check scanning device in Digital Check's lineup. 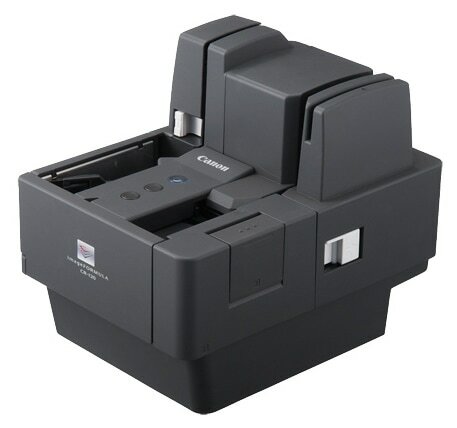 *Note: This model is a companion scanner to the Digital Check TS240 TTP - Teller Transaction Printer. View Printers to learn more. The TS230 is ideal for small business remote deposit capture, teller window capture, the commercial window of banks, the back counter of small branches or for corporate capture. 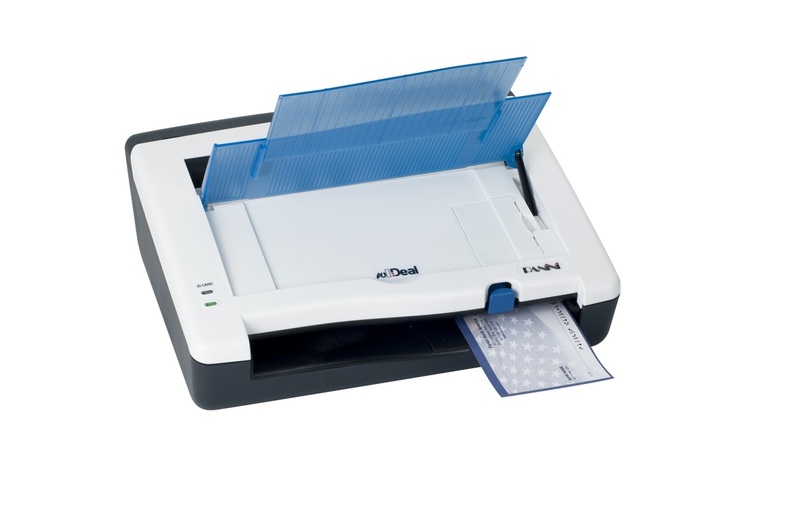 The TS230, with Digital Check's unique continuous feed feature, allows checks to be added while scanning - for higher throughput and more volume than traditional scanners. The TS230's quiet operation is ideal teller operation or treasury office activities. 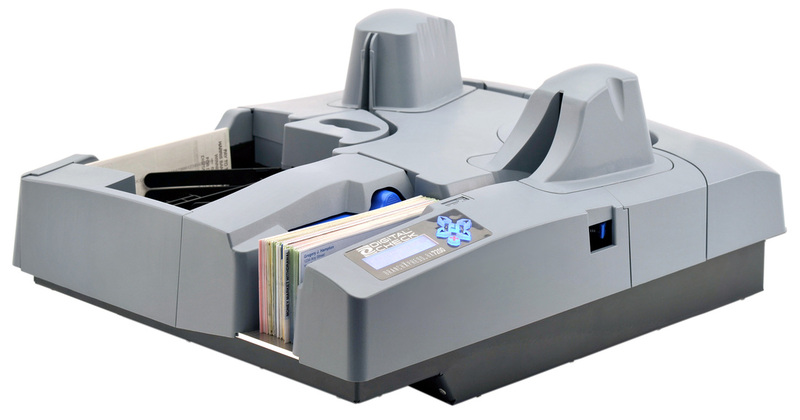 The CheXpress CX30 was the first check scanner designed specifically for remote deposit capture, combining accuracy and reliability with an affordable price. 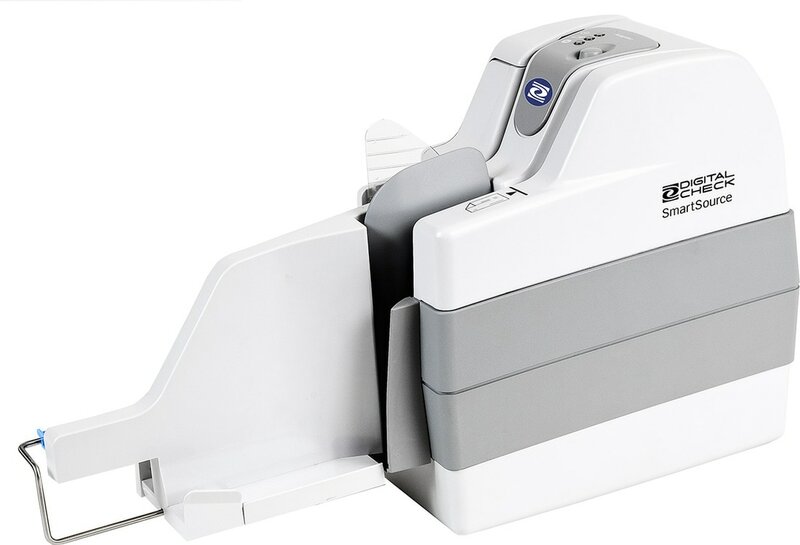 As one of the lowest-cost duplex, MICR-enabled check scanners on the market, it brings bank quality and durability within reach of small and medium-sized businesses. That’s why the CX30 has become one of the best-selling remote deposit scanners of all time. For handling production-level branch capture scanning, the BranchXpress BX7200 is second to none. A massive 300-item feeder, 200 document per minute top speed and sorting capability to dual 300 item output pockets make it the perfect choice for high-volume check scanning in production capture environments. The SmartSource Merchant Elite scanner has been optimized for remote deposit capture applications. With a processing speed of 55 documents per minute and a 100-document auto-feeder the SmartSource Merchant Elite scanner quickly processes batches of documents. 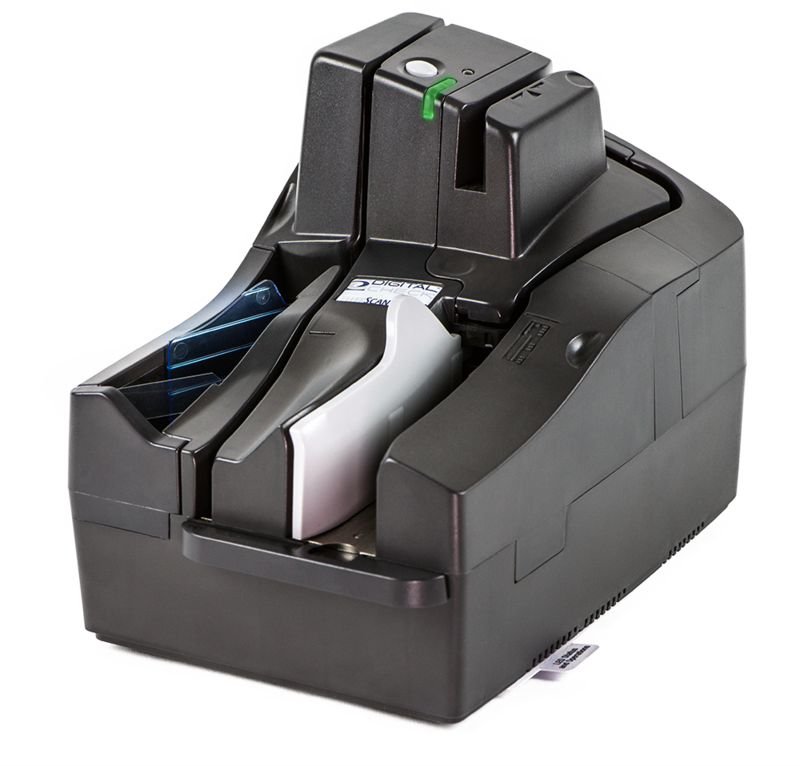 The SmartSource Elite series scanners are designed with the remote deposit capture operator in mind. The robust, maintenance-free design and ease of use ensure a positive experience for the remote deposit capture operator. 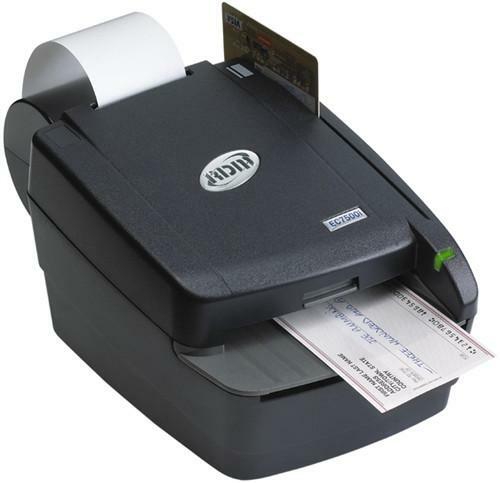 *Note: This model is a companion scanner to the Digital Check SmartSource ReceiptNOW Receipt Printer. View Printers to learn more. With a processing speed of 155 documents per minute, the SmartSource Professional Elite scanner is ideal for higher-volume remote deposit capture applications. 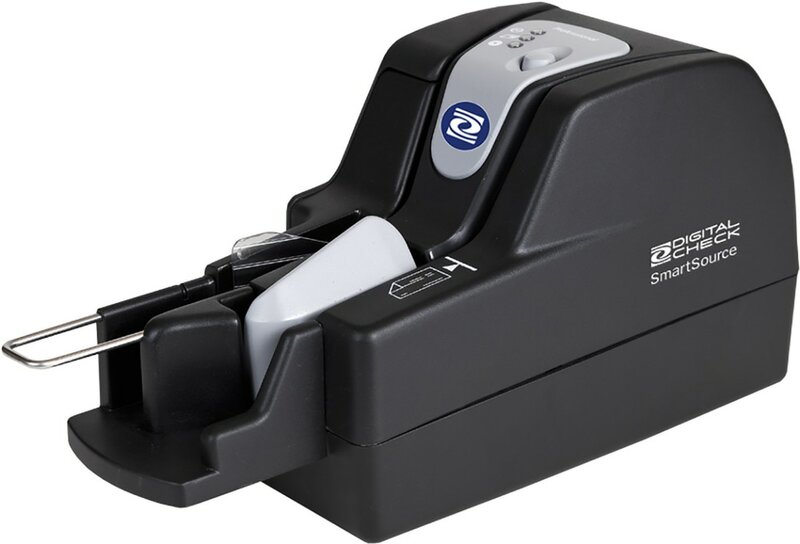 In addition, the SmartSource Professional Elite scanner is configured with a highly flexible rear ink-jet endorser for remote deposit capture applications where endorsing the check is required. The Digital Check SmartSource Expert Elite scanner includes all the features that make the Elite series an ideal check scanner for teller and remote deposit capture plus an added Ethernet connection allowing the device to be shared by multiple users. 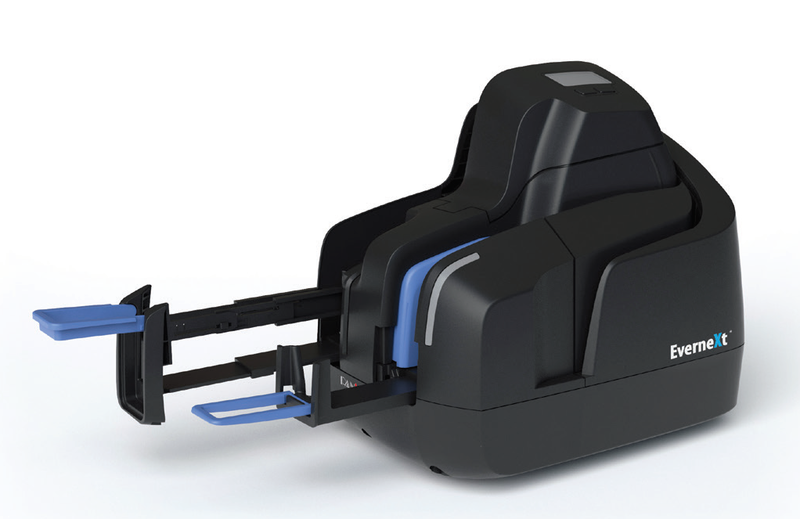 Processing either 55 or 150 documents per minute, this scanner is the perfect fit for deployment in teller and RDC environments. 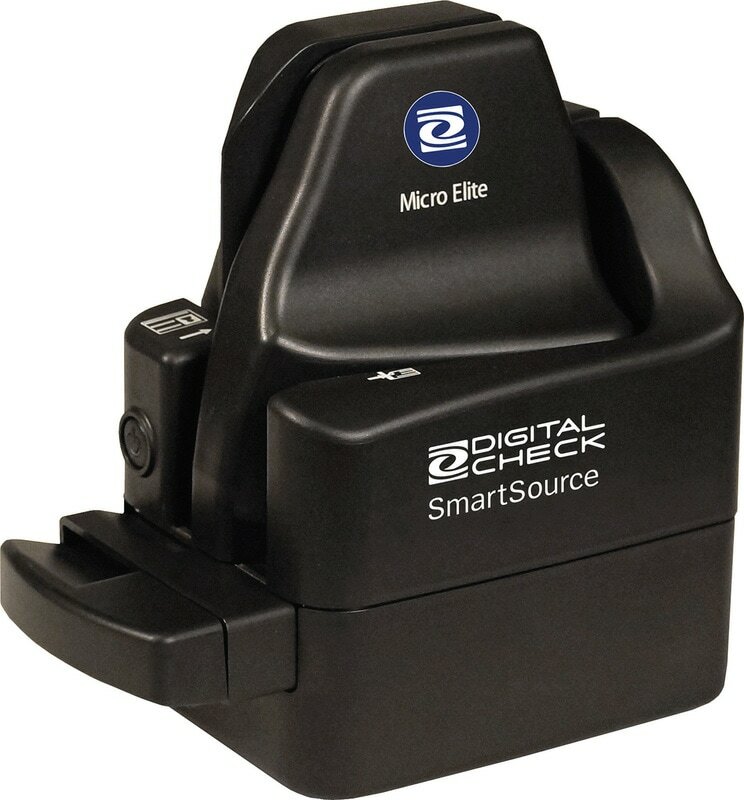 Digital Check's SmartSource Micro Elite scanner is a low-cost, compact-size scanner optimized for low volume applications. 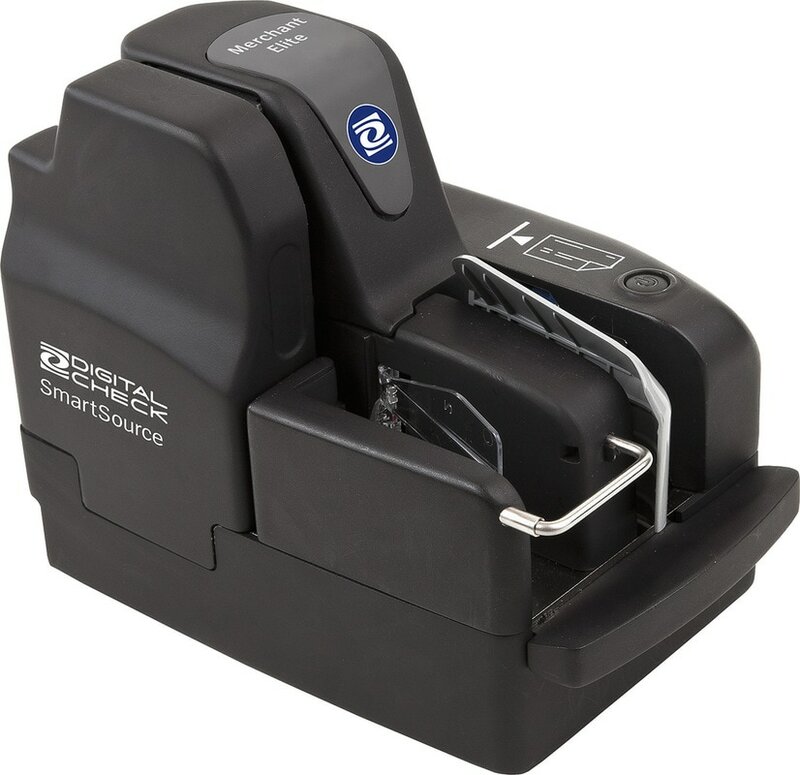 Like all scanners in the SmartSource portfolio, the SmartSource Micro Elite provides industry-leading quality and performance. 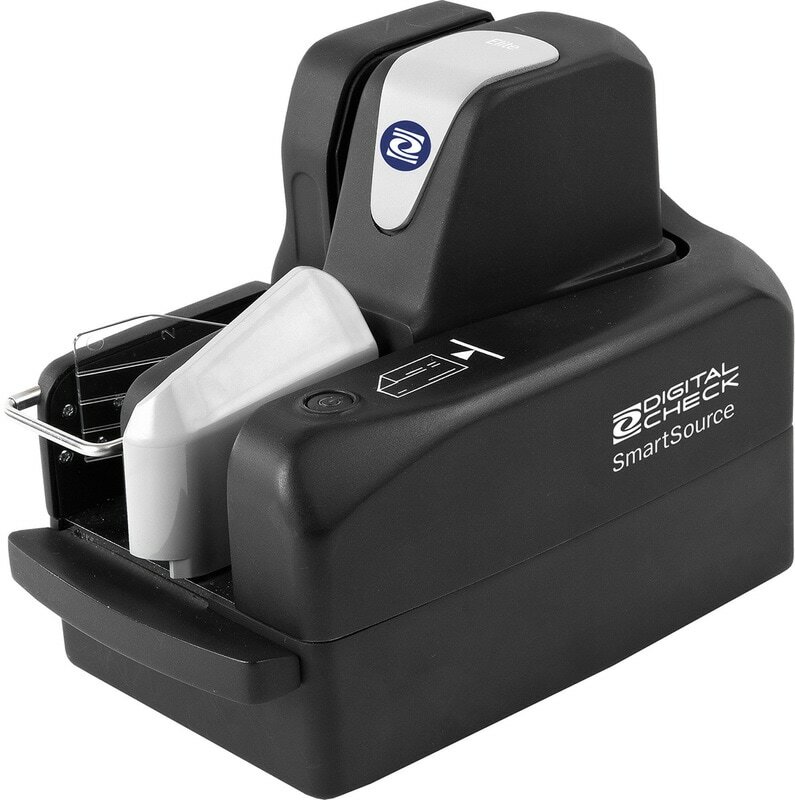 The SmartSource Micro Elite scanner is designed with the low-volume operator in mind. The durability of the scanner, maintenance-free design and ease of use ensure a positive experience for the user. 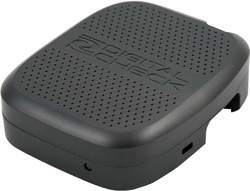 Digital Check also offers the Micro Elite SE version which is optimized for low volume applications to be run over a network connection. The newest SmartSource Professional is designed to meet customer needs in the front counter, back office and merchant environments. The new SmartSource Professional is easier to operate and requires minimal operator maintenance. The new open feeder reduces document preparation requirements and enables easy loading of documents by automatically opening the input hopper when empty. The SmartSource Professional can be configured to start feeding automatically when documents are loaded into the feeder. In case of a document jam, the SmartClear button eliminates the need to open or remove covers to retrieve the document. *Note: This model is a companion scanner to the Digital Check SmartSource ReceiptNOW Receipt Printer.View Printers to learn more. The Digital Check SmartSource Adaptive check scanner allows you to reduce expenses by integrating a single device that can handle all of your document imaging needs at once. This scanner can scan a variety of document sizes and allows for one-handed loading of documents by automatically opening when empty. This check scanner is engineered to process high volumes of daily items, yet it requires minimal maintenance. Digital Check's SecureLink allows your scanner to connect to any other device over either a wired or wireless network. This means that you can control your scanner remotely from any device. This device is compatible with the following Digital Check scanners: CheXpress CX30, TellerScan TS500 and TellerScan TS240. 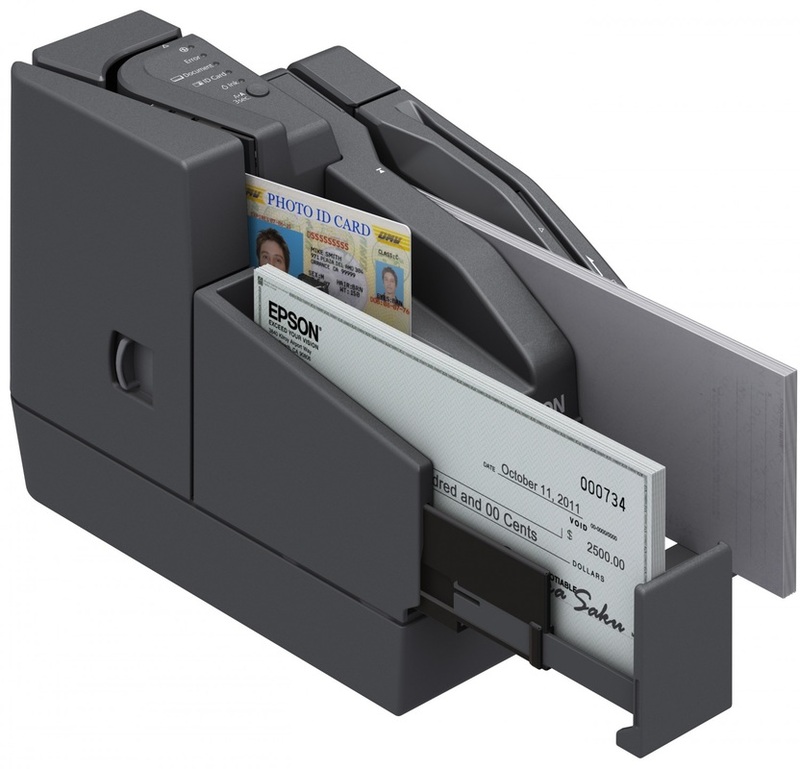 Epson's TM-S1000 CaptureOne check scanner enables financial institutions and their commercial customers to take advantage of all the cost-saving benefits of branch capture, remote deposit capture (RDC) and back office capture (BOC) applications. The CaptureOne check scanner comes in 30, 60 or 90 DPM models. CaptureOne features clear electronic endorsements, a double check detector that virtually eliminates double check feeding and a built-in franker that prints a static message on checks to prevent double processing. Epson's TM-S2000 multifunction teller device offers everything financial institutions need for teller capture, back counter and RDC applications. 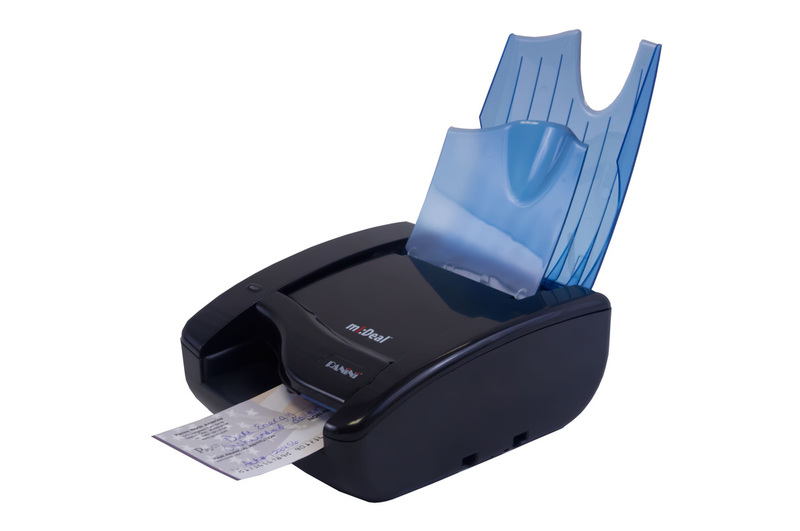 It features the fastest check scanning in its class, high-quality check images, the industry's highest MICR accuracy, cashier check and endorsement printing, two-sided ID scanning and more. 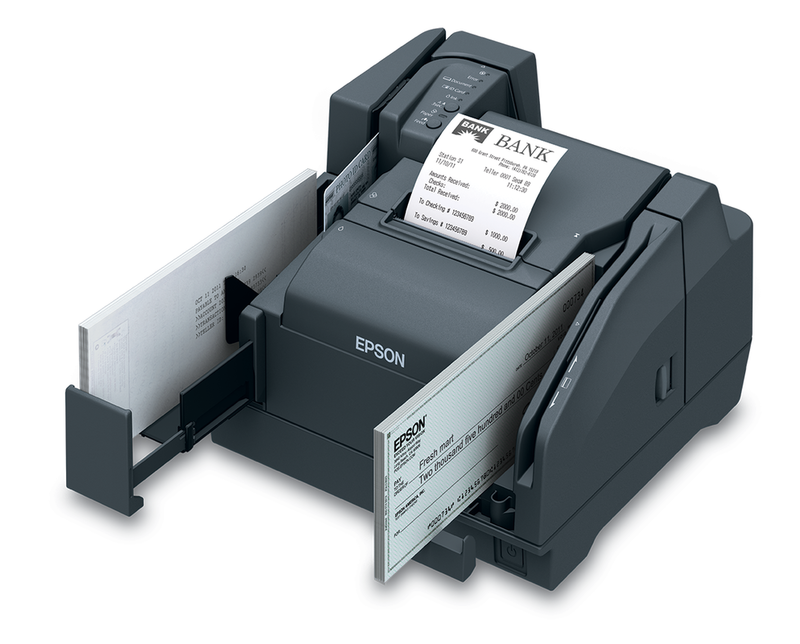 The Epson TM-S2000 features a 100-check document feeder and speeds up to 200 dpm. 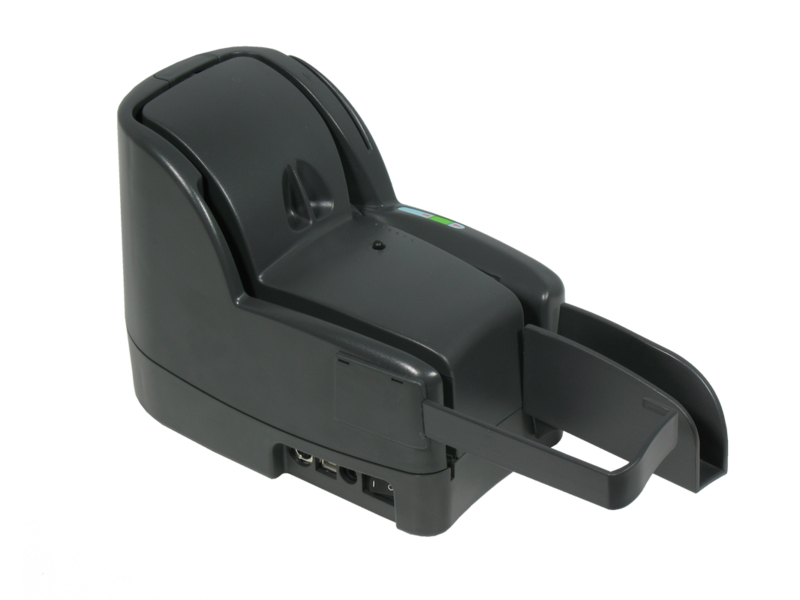 *Note: This model is a companion scanner to the Epson TM-T70II Thermal Printer. View Printers to learn more. For the most demanding and time sensitive check-capture environments, the Panini Vision neXt builds on more than six decades of Panini experience as a global leader in distributed check capture, delivering breakthrough innovation that drives tangible business value. 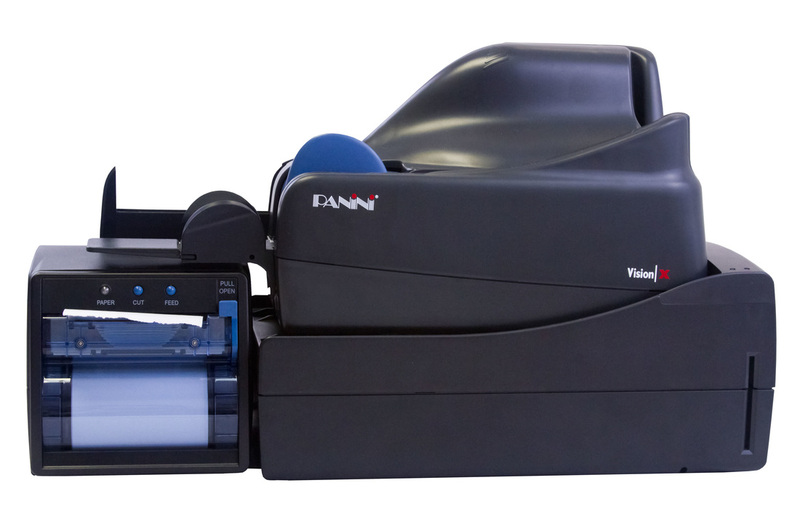 By addressing the most common variables in check capture - environment, operator, and document quality - the Panini Vision neXt provides unparalleled levels of productivity. *Note: This model is a companion scanner to the Panini Vision neXt Stackable Printer. View Printers to learn more. 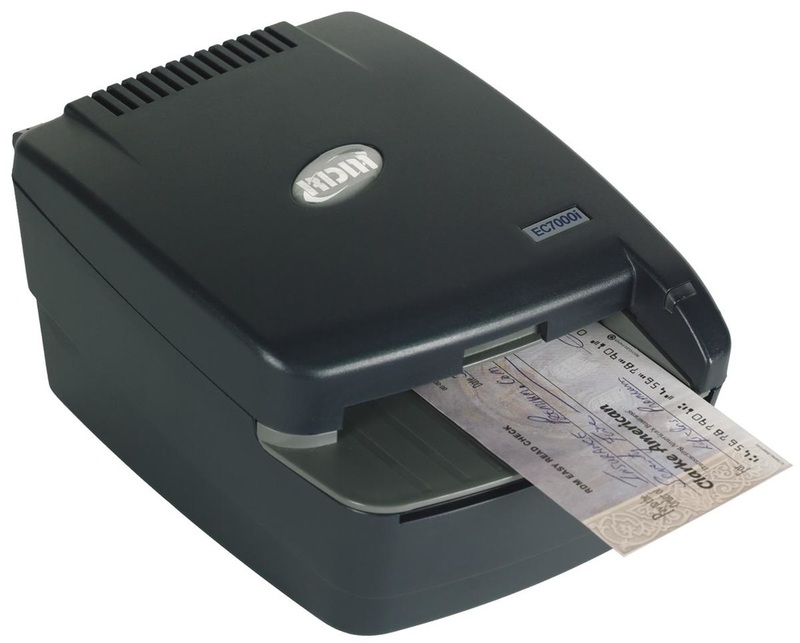 With throughput speed up to 160 documents per minute (DPM) and its on-board intelligence, the EverneXt is designed for the most demanding and time sensitive check capture environments, where it can digitize a wide range of deposit and payment related documents including checks, stubs, and ID cards, maximizing investment ROI while increasing utilization. 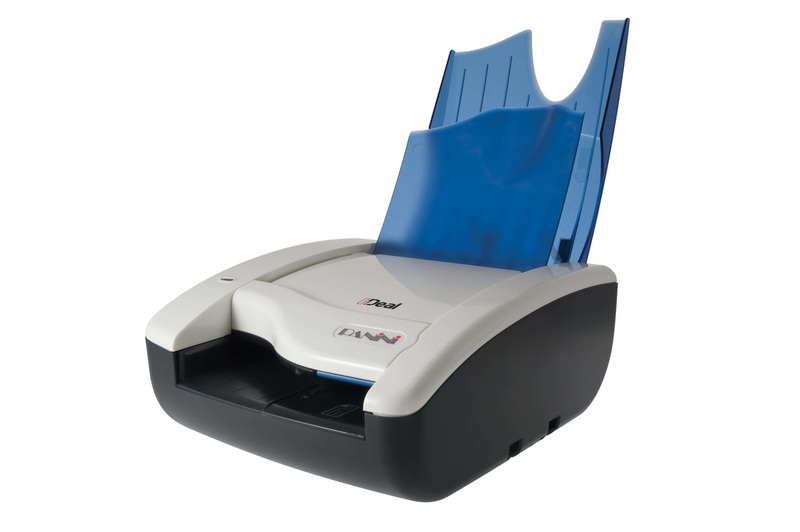 The Panini Vision X check scanner is a scalable check scanning platform designed specifically for distributed check capture. A Vision X device can be quickly and easily upgraded via a software upgrade through the network. Scalability is offered in numerous areas including device speed, printing configurations and document feeding to accommodate a broad range of transaction volume and processing time requirements. 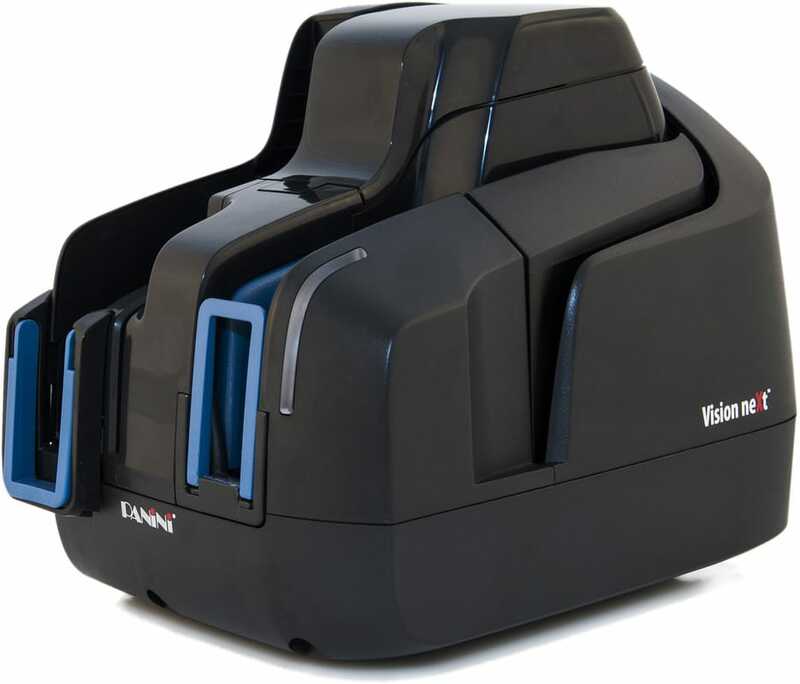 The Vision 1 is able to read MICR with top accuracy, capture superior quality duplex images – including TrueColor and FastColor – and physically mark items on the rear side via its one-line ink jet printer –effectively positioning it for all circumstances where legislation, compliance requirements or the Financial Institution’s preference imposes the use of rear physical item endorsement – while simplified mechanics and no feeder consumables enable even simpler maintenance and increased cost savings. 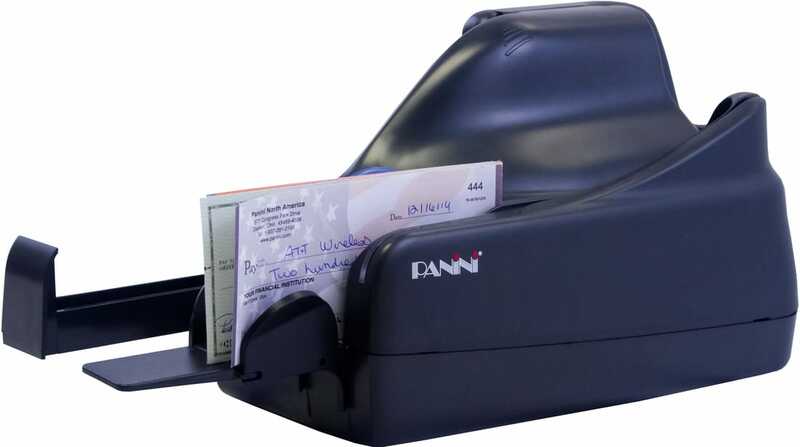 The Panini I:Deal single document check scanner is a breakthrough product designed specifically for the remote deposit capture needs of small business. The I:Deal utilizes patented technologies to deliver capabilities critical for RDC success including high-quality dual-sided image capture, document franking and advanced reading technologies in the areas of MICR and OCR. A pocketing capability minimizes paper handling, providing document storage while ensuring transaction sequence integrity. Combining innovation and ease-of-use with API-free connectivity to RDC, POS, branch and mobility applications, the Panini mI:Deal offers the most reliable and economical capture of checks with comprehensive Check 21 compliance. The mI:Deal enables cost effective and highly efficient check capture in a variety of applications with minimal integration effort. Extending and leveraging the superior design of the I:Deal check scanner, the wI:Deal is an enhanced version that supports all the features of the I:Deal for unsurpassed check reading performance while adding the ability to scan full page documents (including envelopes) and rigid documents, such as ID cards and driver's licenses. Applications include virtual (or distributed) lockbox, small business remote deposit, and vertical industry payment applications including healthcare, insurance, transportation and more. It's also a great solution for capturing a variety of document types at the bank branch platform desk or teller station. Developed specifically for the branch teller environment, the Vision X MFS is an integrated solution platform that offers multiple teller processing technologies in a single, compact, modular footprint. The Panini MFS is the perfect solution for financial institutions deploying branch image capture at the teller, who are also looking for a way to improve teller productivity, consolidate teller counter space and improve customer satisfaction through efficient branch automation. Functions provided by the Vision X MFS include check scanning, validation printing, roll-tape receipt printing, magnetic card reading, smart card reading, flat page scanning, rigid ID card scanning and an open USB port for extension to additional modules. 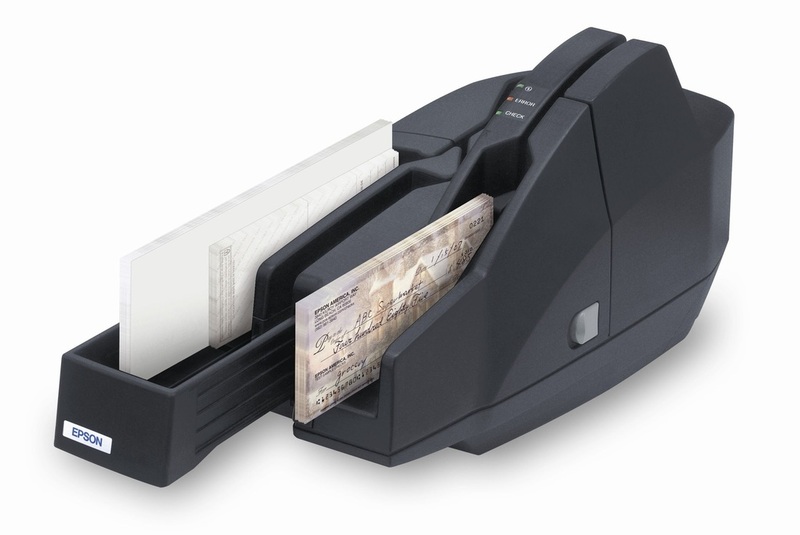 Based on RDM's EC6000i Series with its small footprint, connectivity to most popular POS terminals and industry leading MICR and image technology, the EC7000i features a standard USB port, in addition to a wide variety of optional features such as a Franking Acknowledgment printer, internal alphanumeric OCR A and B character recognition, OCR E13B MICR Assist, and 3-track bi-directional Magnetic Stripe Reader (MSR), positioning it as one of the most versatile and reliable two-sided imaging scanners in the marketplace. The EC7500i Series is RDM's latest addition to its suite of remote deposit capture imaging products. The EC7500i Series is specifically designed for low volume billers and small business customers. Based on RDM's proven technology, the EC7500i series models are all franking enabled which supports the FFIEC guidance for risk mitigation. The EC7500i series is easy to install with its standard USB connectivity and can be configured as a single or dual sided check imaging scanner capturing crisp clear binary images that exceed the industry's requirements for image exchange. RDM’s EC9600i series set a new standard for simple to use, adaptable and cost effective network check scanners within today’s payments world. The EC9600i offers simple, one-touch setup without any drivers to install. It can be easily connected to PCs, MACs, mobile devices and/or payment terminals for check scanning within any operating system, browser, or network environment, including Citrix. We currently do not list all of the products we sell on our website. If you are looking for a particular product, please contact us to find out if we carry it! If you require check scanner repair or check scanner support, please fill out our support request.